Theatre exhibitionists are looking forward to enjoying a good holiday extended weekend thanks to Holi from March 21. There are some major releases to watch out for this week, a couple from Hollywood and a couple from Bollywood. Of course, most of the eyes will be on Kesari, which marks Akshay Kumar's first release of the year 2019. Kesari is based on the 1897 Battle of Saragarhi and also stars Parineeti Chopra as the female lead. Kesari Star Akshay Kumar Wants To See a Chapter on Battle of Saragarhi in History Textbooks. Akshay Kumar's turbaned look as Havaldar Ishar Singh has got him much appreciation. This is the first mainstream movie that looks into the famous battle where 21 Sikhs from the British-Indo regiment withstood 10,00 plus Afghani invaders and lost their lives in the process. Kesari is directed by Anurag Singh, while Karan Johar is one of the producers of this historical drama. 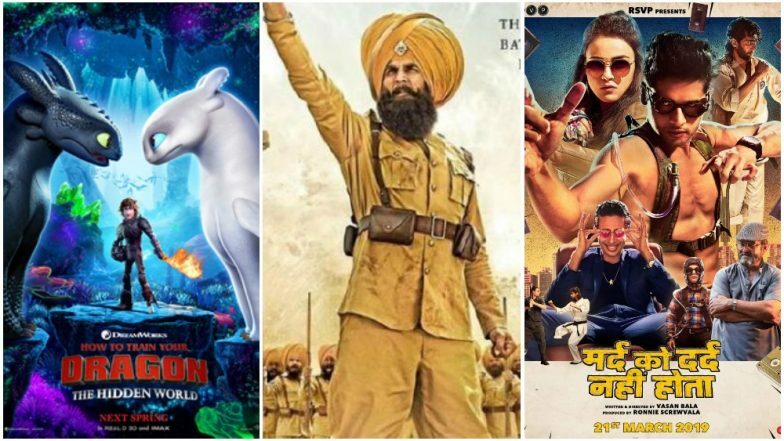 At the box office, the movie is expected to take a good opening, thanks to Akshay Kumar's star-power, Karan Johar's brand value and the Holi advantage. The second Bollywood film, Mard Ko Dard Nahi Hota, is an unusual film to compete with Akshay Kumar at the box office. Directed by Vasan Bala, the movie is a quirky superhero comedy about a vigilante who suffers from a rare condition that makes him impervious to pain. Newcomer Abhimanyu Dassani, the son of actress Bhagyashree, is making his debut in the movie, while Radhika Madan is the female lead. Mard Ko Dard Nahi Hota also stars Gulshan Devaiah and Mahesh Manjrekar. Did Ranveer Singh Pack a Punch to Mard Ko Dard Nahi Hota Actor Abhimanyu Dassani? Watch Video. From Hollywood arrives the third instalment of How To Train Your Dragon franchise. How To Train Your Dragon: The Hidden World makes us return to the adorable adventures of Hiccup and his pet dragon, Toothless, as they face yet another inimitable foe. Jay Baruchel, America Ferrera, Cate Blanchett, Jonah Hill, Kristen Wiig, Christopher Mintz-Plasse, Gerard Butler, Craig Ferguson, Kit Harrington return to voice the endearing recurring characters from the previous movies. F Murray Abraham is voicing the antagonist in the movie. There is also The Informer, a British action crime thriller film based on the novel Three Seconds. The movie stars Joel Kinnaman, Rosamund Pike, Clive Owen, Common and Ana de Armas. Movie You Are Most Excited to Watch on March 21? So which of these movies are you most excited to watch this weekend? Vote for that in the poll section above, and of course, share your thoughts about this in the comments section below.